What’s on the needles? Nothing! OK, not nothing, but we are giving the knitting needles a break. Alison (who handles all of your pattern support questions, as well as generally being the glue that holds the Design Team together) has been on a crochet kick this summer. Alison learned to crochet when she was about 10 (knitting came later) so she says crochet still feels like play. Crochet is fast and fun but its also very forgiving, its easy to fix a mistake and projects fly off the hook. Alison says she finds crochet liberating. 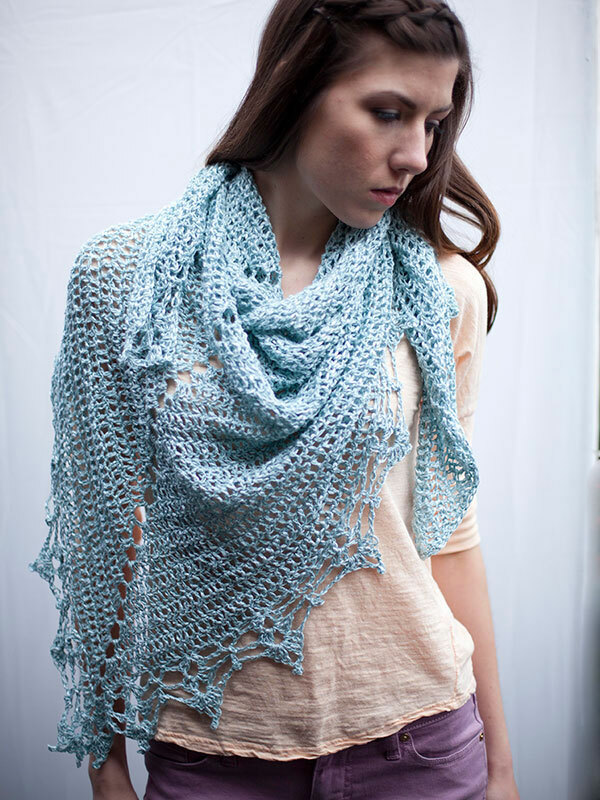 She’s currently making Halstead, a free crochet pattern designed by Mary Beth Temple (available on Berroco.com). Alison is making her version of the shawl in Berroco Lago shade 8469 “Sundown.” Halstead is an easy pattern, suitable for a beginning crocheter… There is even a how-to video to walk you through the edging. When you take a break from your knitting do you pick up other crafts? Tell us about it in the comments below!